WARNING: Due to matters out of my control, some links on this page have been moved or re-moved. These links are currently being investigated and replaced, either dirtectly or with relevant static pages. Please accept my apologies for this slight disruption over the next week or so. One of the things I often get asked about are crayfish on the river Bain. First of all, the crayfish on this site are all American signal crayfish. There are only very isolated pockets of English white-clawed crayfish remaining in Lincolnshire. Secondly, it is illegal to remove any crayfish from any river without first applying for a licence from the EA and all signal crayfish removed must be destroyed. All the crayfish (out of water) pictured on this site, were humanely killed. 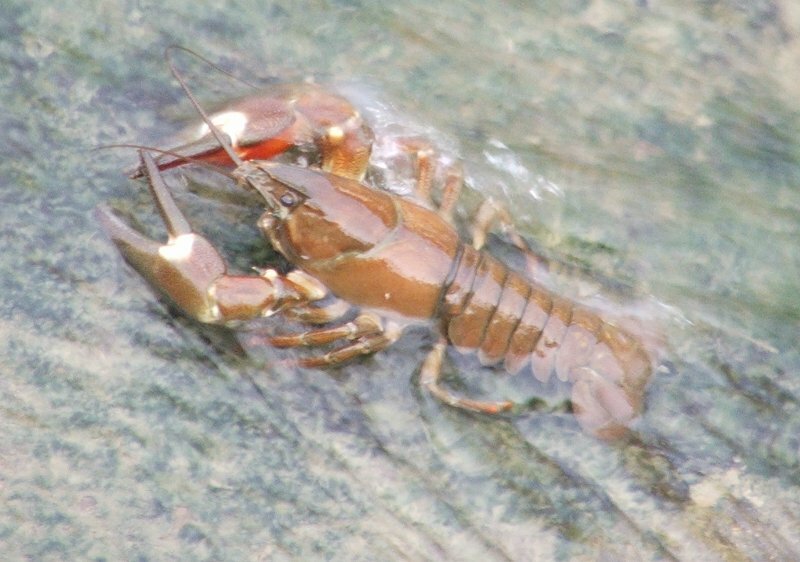 Signal crayfish carry a disease (fungus) that kills the native white-clawed crayfish within just a few weeks and it is for this reason any contact with signal crayfish must be considered an ecological threat. If you move from water to water you will carry the virus on your boots, clothing and fishing tackle. So always remember to clean all your fishing tackle - boots, nets, etc. AND please get rid of that damned "Stink-bag" out of your car boot: one of the worst things invented for transferring disease between fishing venues. Every sample we take from the Bain, contains crayfish. From tiny little fellows to the big 'uns like this! Signal crayfish are easy to identify. Look at the underside of the front claws - bright scarlet red. And on the top of this same claw, at the joint where the pinching claws meet there will be a pale blue or white-ish patch - the "signal" in signal crayfish, viz. the picture below. 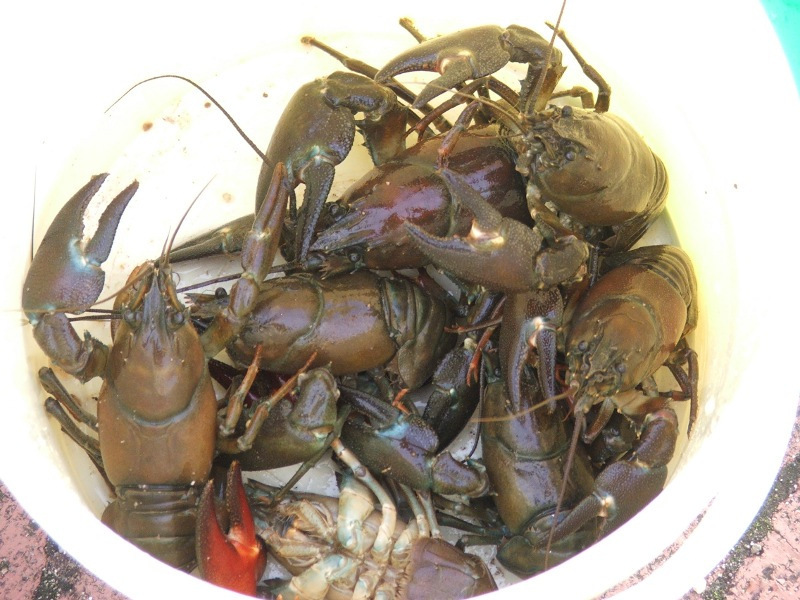 If you wish to trap crayfish, you must apply for a licence from the Environment Agency Trapping Licence Application which is simple to apply for and implement. You will need to buy authorised traps, each will be issued with a number and tag by the EA and you will have to notify them of a grid reference where you intend to trap. You must report all crayfish numbers and finally the best bit - the licence is free! 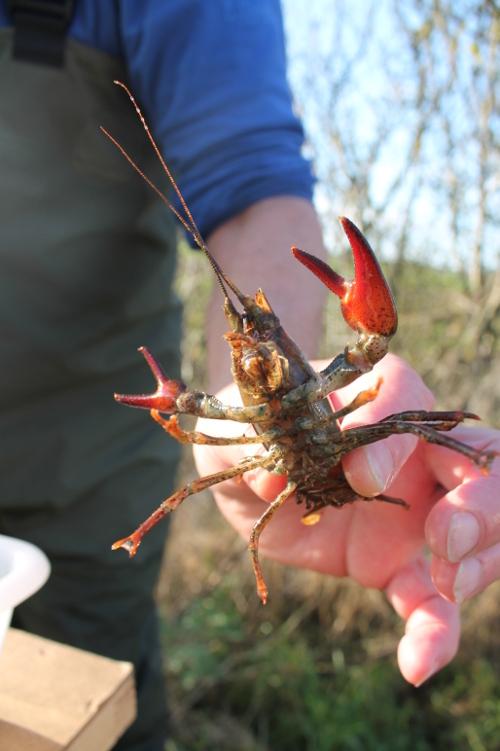 Most of the waters in Lincolnshire now have thriving colonies of signal crayfish. The one shown was a pretty determined little crayfish, he was attempting to climb a weir, travelling upstream but he kept getting washed down with the flow of water (more images below). He made it on about the 5th attempt. But we then heard a story about a crayfish that spent an entire week climbing a vertical wall of a weir before finally succeeding. Signal crayfish are extremely predatory and move between water courses overland at night, they climb, they are canibalistic, eating both eggs and young crayfish if they can catch them. They kill other species of crayfish with a disease they carry (crayfish plague) - a more detailed, scientific description of the disease is given in a reference below. Crayfish love fish eggs and will root them out of redds. They are destructive, digging hibernation burrows (image below) into soft banks during winter causing banks to erode and undercut more quickly than would otherwise be the case. If you know of, or see crayfish in your stretch of water anywhere in the UK, please do get in touch with someone (EA, us, local angling club, etc.) and report what you have seen. Photographs will help, and an O/S grid reference is essential to locating the observation site - thanks. 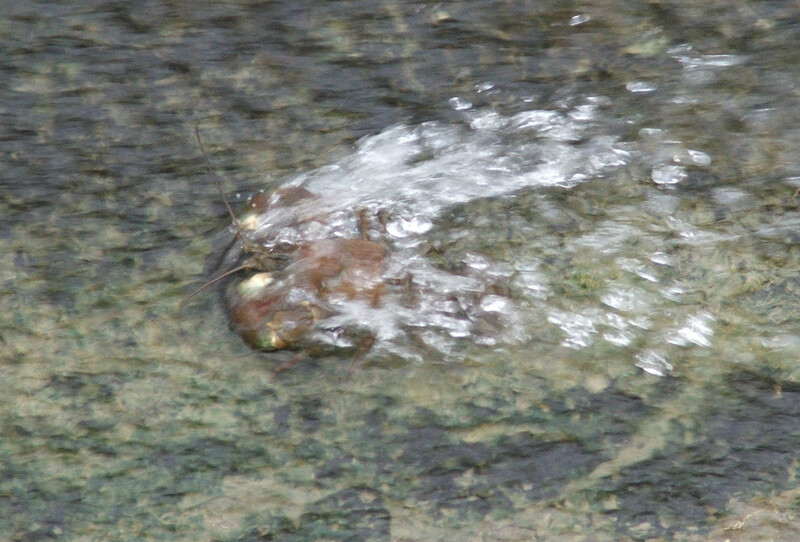 The omnivorous signal crayfish are so invasive and voratious, that once they have consumed all other food sources; they eat detritus, dead and decaying organic matter, and water-born invertebrates like mayfly larvae, fish roe, small fish if they can catch them, but being canibalistic they will then eat each other. This image shows just how destructive the signal crayfish can be. As light levels reduce at the approach of winter and the water levels increase and the water temperature cools, signal crayfish look for soft river banks in which to hibernate. This hibernation is not terribly well understood, but brooding females, animals under predatory stress, and with reduced activity because of lowering water temperatures, will resort to burrows. The effect is obvious, leaking water courses, river-bank collapse and unstable banks result from this activity. Crayfish also moult at intervals during their growing season, at this time they are particularly vulnerable and may choose to spend part of this time in a burrow for safety reasons. "In-berry" females, that is egg-carrying females often choose to use the burrows as protection for the berries until such time as they hatch when she will re-enter the watercourse for her young to migrate into the river. Above I spoke of determination in a crayfish; this fellow is climbing the water-flume at Victoria Mill in Horncastle. He spent some time attempting the climb againts the water flow, but eventually he made it. You can see from the picture that the flow of water over the crayfish was considerable, but he managed to cling on using only his walking claws. Where there are high concentrations of crayfish, you may get the chance to see someone fishing for the things and get a photograph from them like this. The trapper had just emptied his net. Like it or not this does happen, crayfish are a delicacy when cooked properly, even if a bit of a mess to eat - you need a supply of napkins! In the southern USA, the States of Lousiana, Missouri, i.e. the Kajun states a "Crawfish boil" is usually a big family, or neighbourhood event with ten-gallon cooking pots and crayfish bought in nets of 20lbs. Identifiying crayfish is simple and the few steps here will allow you to make a positive identification quickly and simply without too much fuss and be absolutely sure you have the right animal. First of all we are dealing at most with three species of crayfish. Native white-clawed, American signal, and Turkish crayfish. The Turkish (narrow-clawed) crayfish is, as it sounds, narrow-clawed refering to the large pincers of course. This guide is for people who are most likely to come into contact with crayfish. If you want to go into this in more detail, you will need a licence from the Environment Agency to trap crayfish - though I doubt our Polish cousins could care less! So you are out fishing and detect a bite you come up with this horrible looking thing, a bit like a small lobster - what is it? 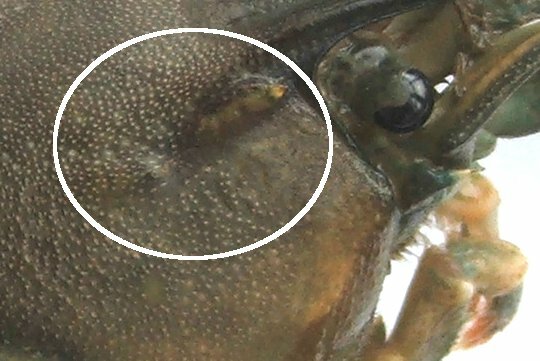 Look at the top of the crayfish - does it have "signals"? The finger joints of the signal crayfish: the main joint on the big front claws, will have white or pale blue patches (see images). Is the shell mostly smooth? 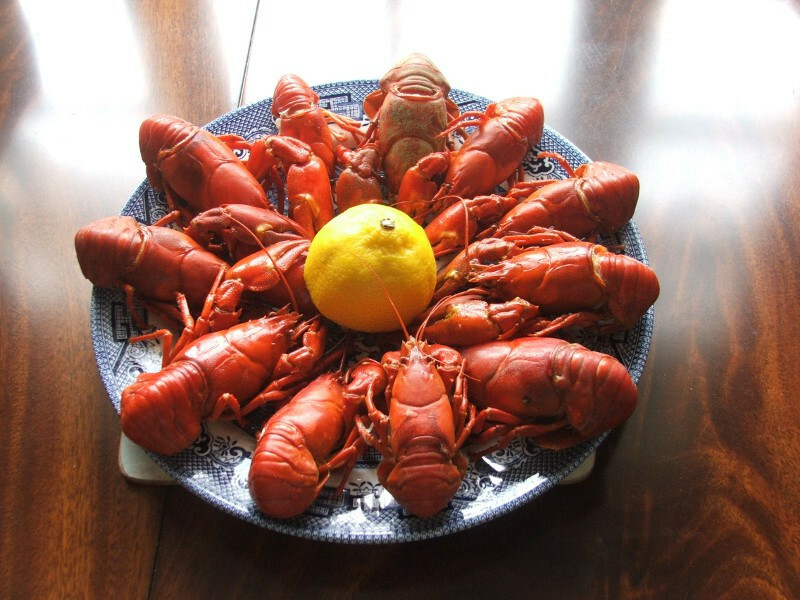 White clawed crayfish and Turkish crayfish are covered in bumps. Turn it over, and is the underside of the claws bright red to pinkish red? Signal crayfish have red or red-pink claws. White clawed crayfish have dirty greyish-pink to white undersides. 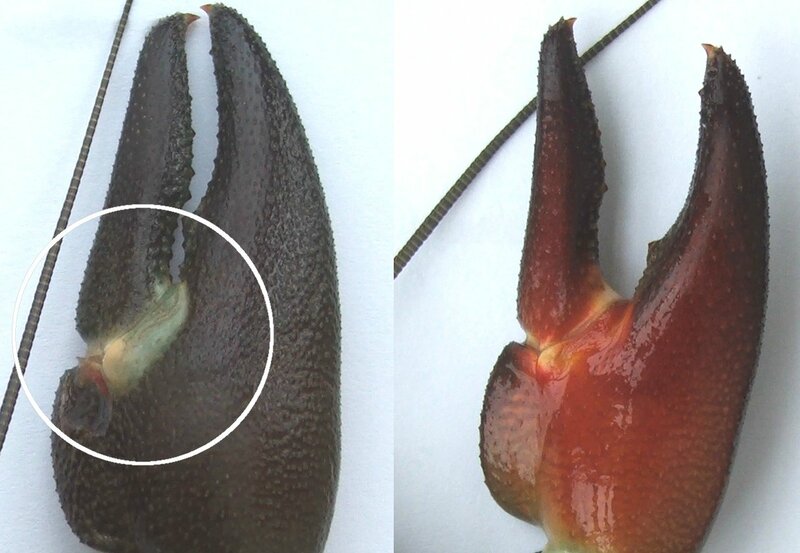 Looking at the image on the left, this shows the claws of the signal crayfish, note the white-blue patch at the finger joint, and the bright red colour beneath the claw. The native white-clawed crayfish has no 'signal' and the underside of the claw is pale-grey. Turkish crayfish claws are much narrower than either the signal or white-clawed. The white-clawed crayfish is rough on its surface compared to the signal, whose carapace is relatively smooth. but the Turkish crayfish is also rather rough, so care must be taken with ID on this basis only, see the photo below for a more accurate ID between species. An excellent photographic guide is available from HERE - the NNSS (Non Native Species Secretariat) is the place to be for information on crayfish and other non-native species in Britain. On both the signal crayfish and the turkish crayfish, imediately behind the eye is a ridge; these are called the post-orbital ridges. On the English white-clawed crayfish, there is only ONE bump on the ridge whilst on the signal and Turkish, there are two bumps. These bumps are often somewhat indistinct and a magnifying glass will soon show these ridges and the bumps more clearly. 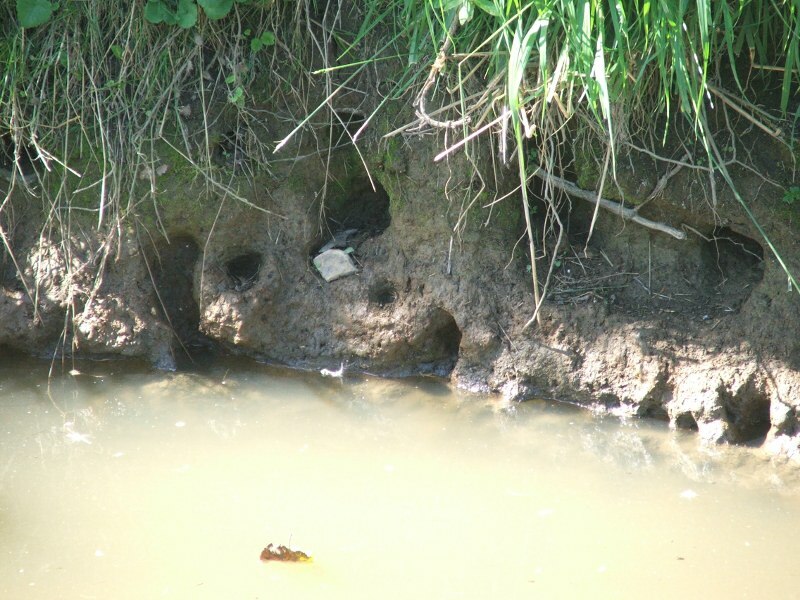 Crayfish Plague is the factor that has decimated the English cryfish population. This disease of crayfish is carried by the signal crayfish and the Turkish crayfish with little effect on them, but will kill the English crayfish within just a few short weeks. To read about crayfish plague in detail - the article is that adopted by international convention and somewhat scientific, but the definitive description of the disease is contained in that article.